Today (April 28, 2014): Top 10 hotel rooms with a view. Location, location, location! We all like a room with a breathtaking view, whether it’s a spectacular outlook over snow-capped mountains or a sweeping vista of the glittering blue ocean. And we are prepared to pay extra for one. I hereby present you the top 10 hotel rooms with the most spectacular views in the world. There is more information below the slideshow. Think I missed one? Share your favorite hotel room view in the comments section, or take my poll at the bottom of the page! Atop the 118-storey, 1587ft (484m) International Commerce Centre (ICC) sits the Ritz Carlton Hong Kong, the world’s highest hotel, with most rooms and suites boasting incomparable views of Victoria Harbour and the glimmering skyline of neighbouring Hong Kong Island. Inside, soaring architectural elements encrusted with custom glass artwork echo the signature glamour of the city below. The awe-inspiring 118th-floor bar, Ozone, the highest of its kind in the world. Other top 10 accolades: The Ritz Carlton Hong Kong also features in my top 10 lists of the world’s highest hotels, the best luxury hotels in Hong Kong, and best luxury hotels in China. Tip: enjoy free VIP amenities when booking via Virtuoso (e.g. room upgrade, daily breakfast, early check-in, late check-out, $100 USD food credit). Located on the picturesque south-western coastline of Mahé island, the 60 exquisite Creole-style villas of Banyan Tree Seychelles are located along a fabulous crescent of powdery white sand, backed by hills that are covered in lush rain forest. From the spacious terrace of the five exclusive Intendance Pool Villas, you will enjoy a stunning bird’s-eye view of the Indian Ocean, Intendance Bay and the lush tropical mountain greenery surrounding Banyan Tree Seychelles. Other top 10 accolades: Banyan Tree Seychelles also features in my top 10 lists of the best luxury hotels in the Seychelles and the world’s most beautiful hotel beaches. Review: to read my review of the Banyan Tree Seychelles, click here. Al Maha, A Luxury Collection Desert Resort & Spa, is nestled in a verdant palm oasis, deep within Dubai’s magical dune and desert landscape. 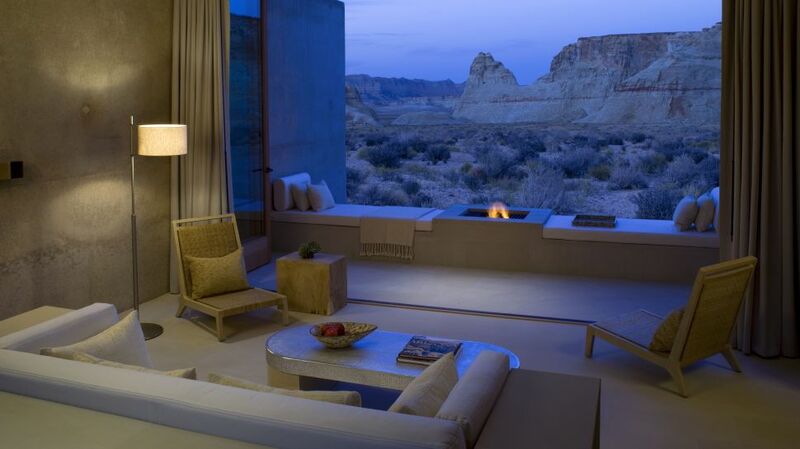 The suites are faced far apart, blend gently into the desert and offer unsurpassed luxury. Beautifully furnished with a unique collection of authentic Arabian artifacts and antiquities, all suites boast private pools and offer spectacular views of the Dubai Desert Reserve and its wildlife. Other top 10 accolades: Al Maha Desert Resort & Spa also features in my top 10 lists of the world’s most luxurious desert retreats and the world’s most luxurious glamping sites. Tip: enjoy free VIP amenities when booking via Virtuoso (e.g. room upgrade, daily breakfast, roundtrip private airport transfers, $45 spa credit, $45 food and beverage credit, early check-in, and late check-out). Review: to read my review of Al Maha Desort Resort & Spa, click here. The hotel is approached along a sweeping driveway, verdant with native trees and lit by flaming torches. Just inside, a Mughal style quadrant is ornamented with cascading fountains and framed by an arched passageway and gold leaf frescoes. 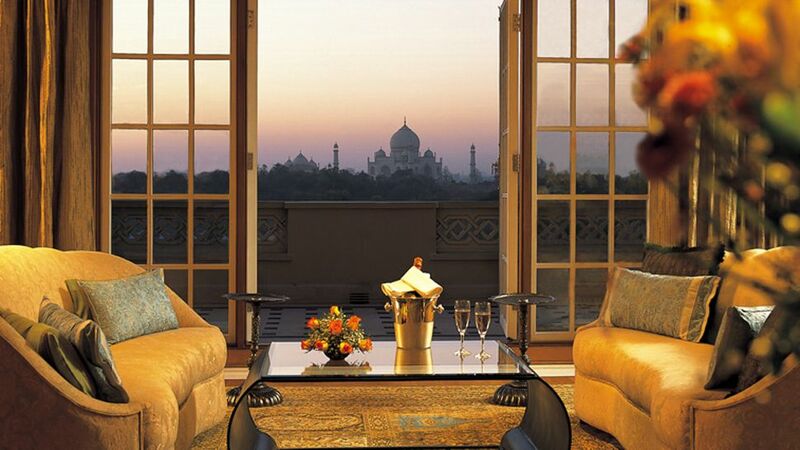 Located 600 meters from the world-famous Taj Mahal, all rooms, suites, lobby, bar and lounge offer breathtaking views of the monument. At night, you can savour a candlelit dinner beside its soft silhouette. Tip: enjoy free VIP amenities when booking via Virtuoso (e.g. room upgrade, daily breakfast, one lunch for two, early check-in, and late check-out). Individual bridges leading to exceptional infinity pool suites and rugged stoned-faced columns reaching towards the sky, make Jade Mountain one of the Caribbean’s most mesmerizing resort experiences, especially for honeymooners. With the fourth wall entirely absent, Jade Mountain’s 29 suites (called “sanctuaries”) are stage-like settings from which to embrace the full glory of St Lucia’s twin peaks, the Pitons World Heritage Site, and of course, the eternal Caribbean Sea. Other top 10 accolades: Jade Mountain also features in my top 10 lists of the world’s best resorts with private plunge pools, the world’s best luxury hotels, the world’s best honeymoon resorts, and the most luxurious resorts in the Caribbean. Tip: enjoy free VIP amenities when booking via Virtuoso (e.g. room upgrade, daily breakfast, $100 USD spa credit, early check in, and late check out). Review: to read my review of Jade Mountain, click here. Located in the stunning waterfront area of Spain’s most dynamic and stylish city, W Barcelona boasts unparalleled views of both the Mediterranean Sea and the City of Barcelona from most of its 473 fabulous guest rooms and suites. Rising like a sail from the Mediterranean’s brown sands, it is as much a work of modern art as it is a luxury brand hotel. Designed by world-renowned architect Ricardo Bofill, the W Barcelona sets the scene for a spectacular stay just steps from the famous Barceloneta boardwalk. Other top 10 accolades: W Barcelona also features in my top 10 lists of the most amazing city hotels in Europe and the world’s best urban resorts. Tip: enjoy free VIP amenities when booking via Virtuoso (e.g. room upgrade, daily breakfast, early check-in, late check-out, and USD $100 food or spa credit). Review: click here to read my review of the W Barcelona. Explora Patagonia is located at the center of the Torres del Paine National Park, a UNESCO Biosphere Reserve. Anchored like a white ship on the shores of turquoise Lake Pehoé, Explora Patagonia’s unique location sets travelers literally in the middle of Patagonia’s most famous landscape, while greeting them with award winning architecture. The 37 Cordillera Paine Room and the 6 Exploradores Suite all have breathtaking views of the Paine Massif and horns. Other top 10 accolades: Explora Patagonia also features in my top 10 list of the world’s best wilderness lodges. Tip: enjoy free VIP amenities when booking via Virtuoso (e.g. room upgrade, daily breakfast, early check-in, late check-out, and USD $100 resort credit). Soaring 92 stories above the Loop and North Michigan Avenue, Trump International Hotel & Tower Chicago is a showcase of bold style and engaging design, polished stainless steel and iridescent-tinted glass. It is the tallest reinforced concrete building in the world, and downtown Chicago’s most enviable address. 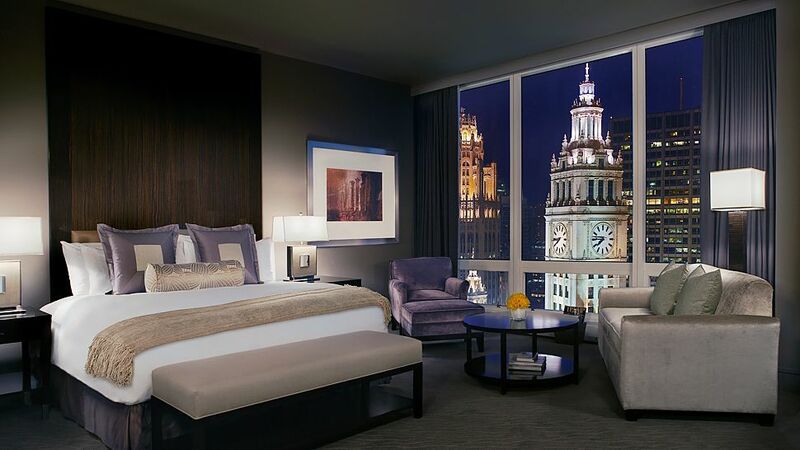 The 339 guest rooms, suites and Spa rooms are immaculately designed and offer, not only the utmost in comfort and luxury, but also incredibly impressive city views through floor-to-ceiling windows. Other top 10 accolades: Trump Chicago also features in my top 10 list of luxury hotels owned by celebrities. Tip: enjoy free VIP amenities when booking via Virtuoso (e.g. room upgrade, daily breakfast, early check-in, late check-out, seasonal amenity, and USD $100 hotel credit). Four Seasons Resort Bora Bora is surrounded by sand-fringed islets on an outer coral reef that enclose a turquoise lagoon with majestic views of Mount Otemanu. Towering above this South Pacific coral island’s vast blue lagoon, its green volcanic cone is the vista from the deck of the over-the-water lodgings. It is overwater Bungalow Suite No. 231 with private plunge pool that has the best view of all. Other top 10 accolades: Four Seasons Bora Bora also features in my top 10 lists of the most spectacular hotel bathrooms in the world, the world’s best honeymoon resorts, and the best luxury resorts in French Polynesia. Tip: enjoy free VIP amenities when booking via Virtuoso (e.g. room upgrade, daily breakfast, early check-in, late check-out, $100 USD spa credit, and complimentary WiFi). Amangiri resort is tucked into a protected valley with sweeping views towards the Grand Staircase – Escalante National Monument. Built around a central swimming pool with spectacular views, the resort blends into its dramatic surrounds where deep canyons and towering plateaus create a raw landscape of immense power. Amangiri’s Aman Spa features a floatation therapy pavilion, water pavilion with sauna, steam room, cold plunge and step pool, fitness centre and yoga pavilion. The panoramic views from the mesa view suites are particularly spectacular at sunset. Other top 10 accolades: Amangari also features in my top 10 lists of the world’s most beautiful hotel swimming pools, the best Aman hotels in the world, the world’s most exclusive wilderness lodges, the world’s best luxury hotels, the world’s best luxury lodges, the world’s most luxurious desert retreats, and the best luxury hotels in the USA. Tip: enjoy free VIP amenities when booking via Virtuoso (e.g. room upgrade, daily breakfast, early check-in, late check-out, a 30 minute scalp massage or neck/shoulder massage, and a toiletry kit with Amangiri’s signature sage shampoo, conditioner, body lotion and body wash). Travel contests & sweepstakes: win free luxury holidays! Last year I have the opportunity on visiting Portman Ritz-Carlton in Shanghai, China. T’was one of the great luxurious experience I ever had. I witnessed the breathtaking skyline views from the luxurious accommodations we stayed. Top 10: hotel rooms with a view. 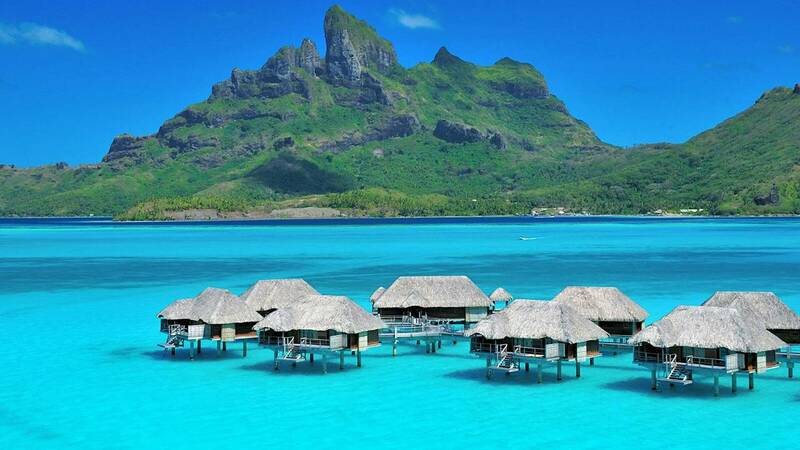 Interesting article here, I bet the Bora Bora view is incredible!